Just finished up a poncho tarp project. I am pretty happy with the outcome, though I haven’t tested it in the rain…yet. I built it out of some .5 oz sq/yd cuben that I had picked up from Zpacks about 5 years ago. 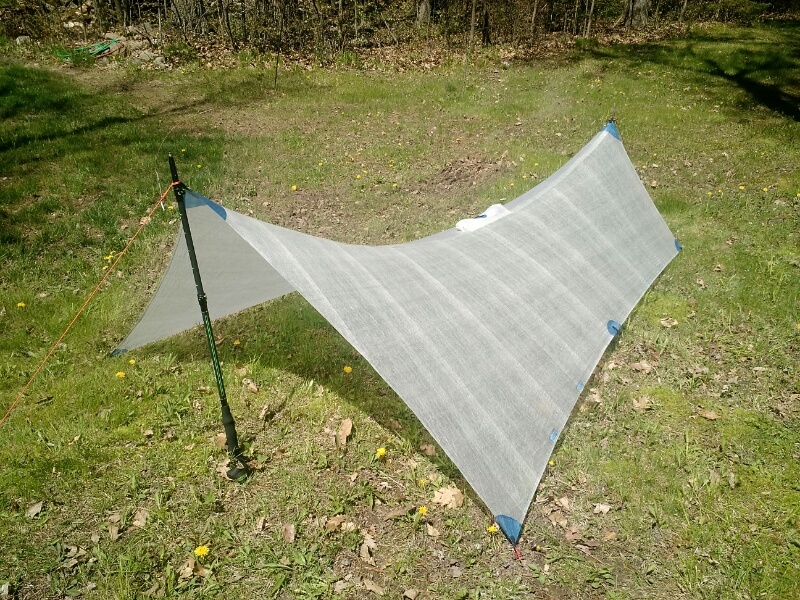 SweetPea and I had built another tarp with the material, but it was simply too big and overall we were not happy with it (lack of catenary cut made for a poor pitch). 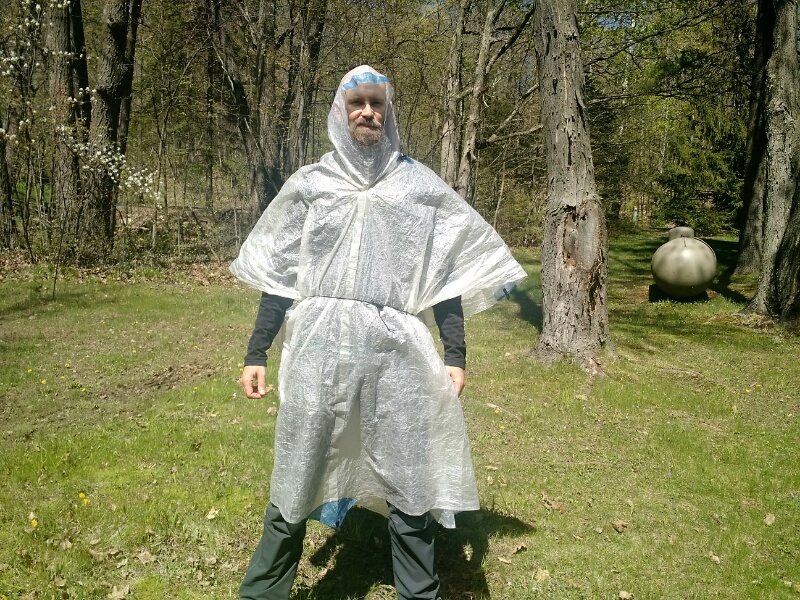 At any rate, we could re-use the cuben fiber, and with my dissatisfaction with my rain jacket/pants on the PCT last year, it really made sense to do this project. Typically, I hammock – and even though I can’t use this tarp with my hammock setup (it is too short for the hammock rig) I figured the extra effort to make the poncho a poncho/tarp would be worth it. If you are unfamiliar with this piece of gear (poncho/tarp), I’ll give a little explanation. Poncho/Tarps are somewhat commonly used among ultra light backpackers as it is a dual use object – poncho while hiking, and tarp for protection at night. 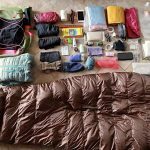 The typical poncho/tarp will weigh between 5 and 12oz, and when one is able to use this single piece of gear in place of two, there is a lot of weight to be saved. As far as design/functionality goes, there is not too much compromise from what I can tell with the poncho/tarps produced by some of the manufacturers. Ponchos are often rectangular like a tarp. The addition of a hole and a hood for one’s head is the major alteration made to what would otherwise be a tarp. My reasoning for building the poncho/tarp is bred more out of the poor performance that rain jackets can have. They will often ‘wet-out’ at the top of one’s shoulders and in the back (because of the constant pressure of a backpack). Additionally, I am interested in rain protection that can go a bit lower on my body. 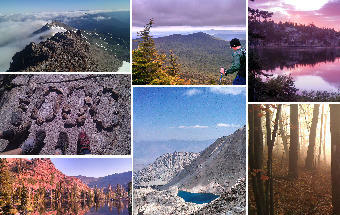 On our PCT hike last summer (2016), we were in rain a lot during our last 3 weeks of hiking (half of our days in Washington), and my rain pants and jacket were used a lot. I am generally not a fan of rain pants, but temps were cool – several days in the high 30s and low 40s, and I used the pants quite a bit. The pants became ineffective quickly (after a full day) as the inner plastic coating started peeling off in the seat…so rain would go down my back and into my pants…unpleasant. 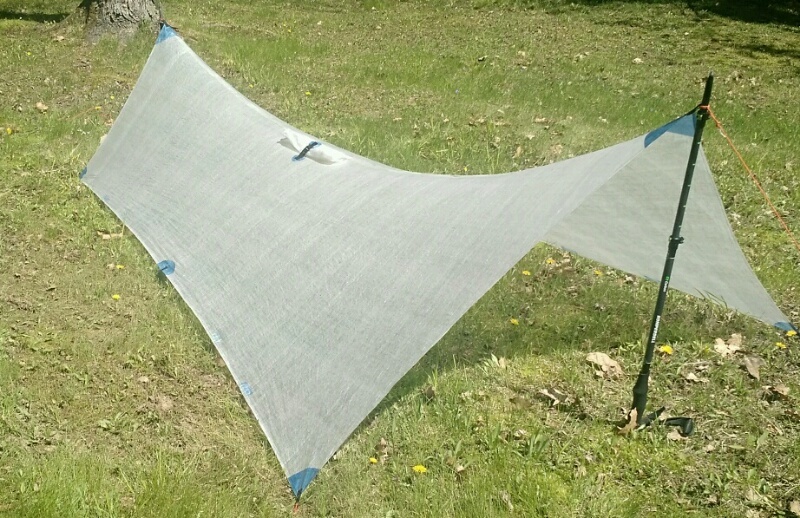 I chose cuben fiber for the project because we had some lying around from another project (and therefore free) and very lightweight. .5 oz sq/yd was used for the majority of the project with a small bit of 1 oz sq/yd used for reinforcement patches (primarily on tieouts). Velcro was used on the edges (for Poncho mode). 1/2″ webbing was used for the tieout connections. 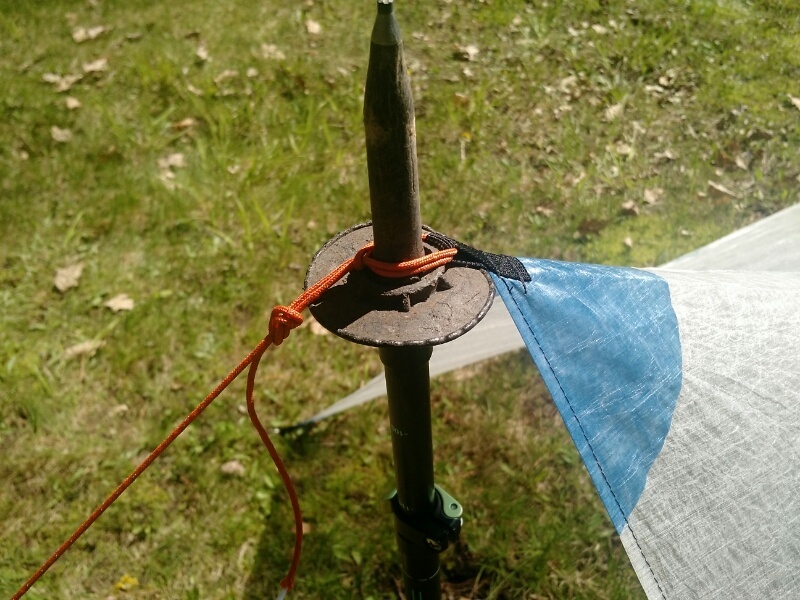 Since the guy lines do not stay on the tarp while in poncho mode, I will use guylines that have a long loop in the end that can make a quick larks-head to attach to the tarp. The hardest part of the project was the hood. I am partially satisfied with it. It is a touch small for me and was the trickiest part of the project to design. I didn’t put a drawstring in the hood, but that will probably be fine because of an already snug fit. The general designing of the hood is part of the difficulty. I used an off-the-shelf poncho’s dimensions. I’d do the same in the future, but add an inch in each dimension. Checking out the Mount Laurel Design poncho tarp page on their website, I found out that there are 60 manufacturing steps in their hood. I believe it. Taping the cuben fiber for the hood was not fun as it is basically taping together two pieces to make a sphere (from the inside), and I’d consider a different design for the future (possibly pie shaped pieces that meet at the apex (like a baseball cap). Cuben doesn’t come in a wide enough sheet to build the tarp without a ridgeline. This is fine, as I wanted to put in a catenary cut, so a ridgeline was needed. For the taping of the ridgeline, we put 1″ painter’s blue tape along the edge of one of the cuben pieces (the edge that doesn’t take the cuben tape) and then used double stick tape to tack that side (the painter’s tape) to the floor. 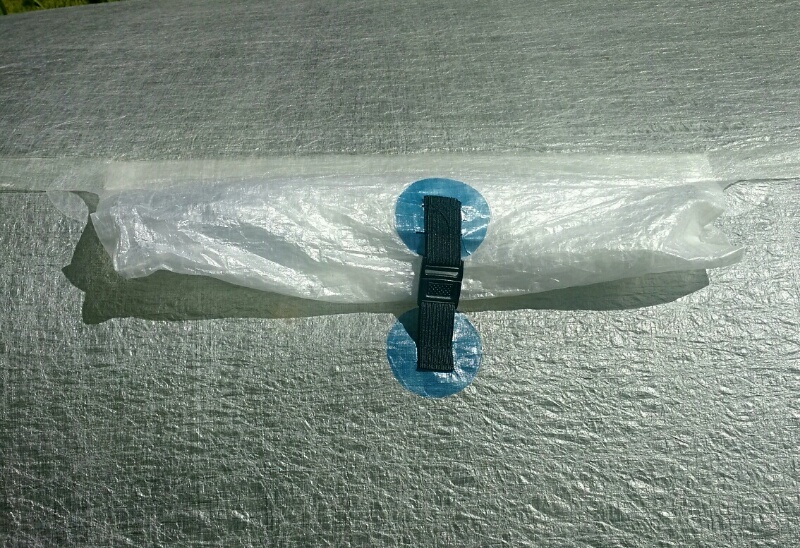 This accomplished two things: we were able to have a reference point for the amount of overlap when taping the two pieces of cuben fiber together (the tape is also 1″ thick, but difficult to see) and having one of the pieces somewhat locked to the floor was a tremendous help in getting a clean taping of the two pieces. In practice, the catenary cut for the ridgeline was more than enough. I don’t believe (at this point) there is any harm in having too much of a cat cut – other than the lost interior space. The 3.5″ cut mentioned above is the raw material differential. When the two sides of cuben are joined, it creates more than that as can be seen in the photos. Doing a cat cut on all of the edges may have been overkill, but having a non-taut pitch is unpleasant. We’ve experienced this with our previous hammock tarps when we have used them for sleeping on the ground. *For the sake of getting quick photos before packing up for a trip, I did not use guy lines on the sides of the tarp to secure it to the ground. The tarp in practice would pitch higher. Though our 2017 hiking season is a bit up in the air (possibly Colorado Trail or Bigfoot Trail, depending on snow falls), most likely this new piece of gear will make an appearance and I will find out if I can bid my rain jacket ‘farewell’. Great job Beardoh, tarp-poncho looks great. I wonder if for the belt it would be better to make a flat one out of cuben (or any other lightweight material) rather than using your guylines. I would imagine a flat belt would abrade less the cuben Tarp-poncho than a rope (i.e guyline)?. I’m not sure, I’m just thinking out loud. I tried to reply to your message on Backpackinglight but for some reason the system does not allow me to answer there. Excellent design. I’m in U.K..I have made 2 similar (but much heavier!) poncho tarps, with catenary ridges, in other material. I was wondering about a cuben version, so your design, detailing & tips are a Godsend. Thank you for sharing this! Hi Neil. 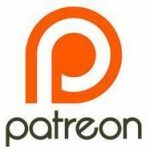 – Thanks for the kind words and checking out the post. The weight of this tarp in cuben is, indeed, excellent. Good luck with yours when you build your next one!